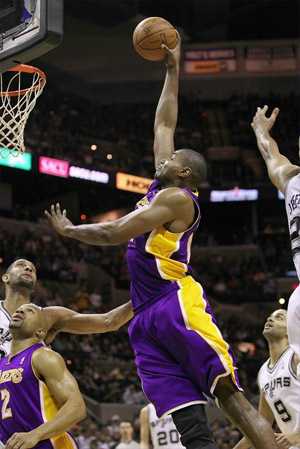 Andrew Bynum slams home two against Spurs. In another lackadaisical second-half effort, the Lakers were blitzed by the San Antonio Spurs and dropped their third straight by 15+ points, 97-82 at the AT&T Center on Tuesday. It was a game that started off well for the Lakers. They kept it close early on, erasing a nine-point first quarter deficit, and taking a 44-42 lead into halftime. After briefly getting up by four in the third quarter, that’s when the wheels came off, and the Spurs took over. Led by the hustle and inside play of undersized center DeJuan Blair, and Tony Parker’s relentless attacking of the basket, the Spurs turned the game in their favor and took over in the third quarter, outscoring the Lakers 29-18 in the period. The Lakers never could recover, and never got the game close again, as the Spurs cruised to the win. Kobe Bryant had another off shooting night, scoring a team-high 21 points, but hitting only 8-27 from the floor. He also picked up another technical foul, his fourth in the three games, after getting into a spat with George Hill in the second quarter. These technicals surely are a sign of the Lakers’ frustration on the court, as they continue having trouble beating good teams. It was another miserable night offensively for the Lakers, as only Andrew Bynum and Ron Artest scored in double-figures, and they both had 10. Pau Gasol took only eight shots, scoring nine points, to go along with nine rebounds. For the game, the Lakers shot a season-low 35.4% from the field. They did outrebound the Spurs 51-50. During this three-game losing streak, the Lakers are also averaging just 80.3 points per game, and have shot under 41% in two of the three games. They also are turning the ball over far too much as well, over 15 per game during the streak. The blowout win was even more impressive for the Spurs, when you consider that Tim Duncan and Manu Ginobili scored only 11 points combined on 4-19 from the floor. In fact Duncan only grabbed four rebounds in 30 minutes of action, yet the Spurs won convincingly. The Lakers will try to avoid their second four-game losing of the season when they play tomorrow night in New Orleans against the Hornets. The Hornets, after starting the year 11-1, have gone only 7-12 since, as they have encountered their own problems the last month. Should the Lakers trade Andrew Bynum? 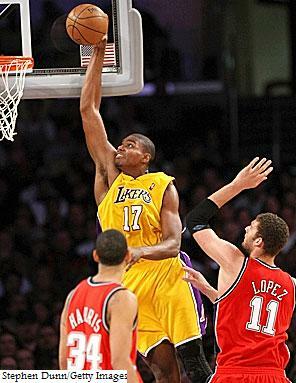 As with any NBA player, the question with Andrew Bynum is will he live up to his potential? He could be the 2nd best center in the league after Dwight Howard. Bynum’s health is the difference between the Lakers being in contention for a championship or being an intimidating juggernaut. While the frequency of his injuries is a concern, the timing of them has also been a problem. Drew is to be commended for playing hurt in last season’s playoffs after not playing in the 2008 finals, but I am wondering if it is possible for him to be healthy for the playoffs. He has played all 82 games only one time in his 5 years; he has averaged 56 games per season. 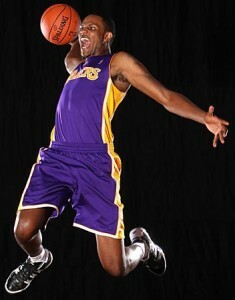 Bynum did not play college ball, so entering his 6th season he will only be 23 at the start of the season. Of course, he will not be playing the start of the season as he recovers from knee surgery in the off-season. If he can come back healthy (relatively) and stay healthy and average double-doubles for the playoffs, then I think the Lakers should keep Bynum. If Bynum misses the start of the season, misses more time during the regular season, and is limping around in the playoffs, then the Lakers should seriously consider trading Bynum and his $13.7 million contract. Plan B for the Lakers, which you will be seeing the at the start of the season, is to have Gasol play center and have Odom start at power forward. Doing this reduces the depth of the Laker bench. So as with Sasha and Walton, I consider this a pivotal year in Bynum’s career. As rookies, Devin Ebanks and Derrick Caracter can count on spending a lot of time at the end of the bench during the regular season, if they’re not shipped off to the Developmental League. In either case, you can view the presence of the rookies as addition by subtraction, as they won’t have to do much of anything to match the output of Josh Powell and Adam Morrison. Plus the combined salaries are considerably lower. And they are young. 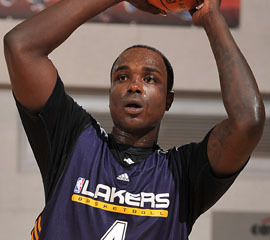 Ebanks, a 6’9″ 215 lb small forward from West Virginia, is only 20. Caracter, a 6’9″ 265 lb power forward from Texas-El Paso, is 22. As second round draft picks, no one should suffer from super high expectations here. I would only expect to see them playing in the preseason and games that are routs (one way or the other). My hope is that they work hard in practice, learn the offense, and realize that their role, coming off the bench, is to preserve and build on any lead that the starters create. Last season It seemed to me the bench was keen on jacking up long distance shots when they didn’t turn the ball over, and letting the opposition drive to the basket without offering much resistance. In short, perfo rming poorly both offensively and defensively. Ebanks has been compared to Trevor Ariza, and if he’s as good defensively, that works for me. The Lakers are a little thin at the power forward position, so I believe Caracter will have more opportunities for playing time. There have been some comparisons to Shaq, as far as commitment to conditioning anyway. His contract has incentives for him not to balloon up in weight. The Lakers are one of the more veteran teams, so I like having a little youth as well. Management was sufficiently impressed with their potential to sign them to contracts, so here’s hoping they contribute in some fashion to the Three-peat. It’s a long season, so having players that the coach has enough faith in to play during the season, thereby allowing the starters to rest, is critically important.